'This last week has certainly seen some of the true highlights of the year so far. On Thursday I travelled up to Padstow to meet with the co-founders of Sea-Changers Rachel and Helen. It was a beautiful sunny day and a perfect setting for what was to be a spectacular day. We were there to hand over the first small grant to the National Lobster Hatchery in Padstow. When Helen told me that they would like to award their first grant to the Lobster Hatchery I was over the moon. Having visited the hatchery some years ago I always felt that this was such a brilliant project and so very effective in the remit of marine conservation. They are an active centre of valuable research and education on sustainable fisheries and aquaculture and they restock lobsters in our coastal waters – what’s there not to love? We were met by Dom Boothroyd the general manager of the Padstow Lobster Hatchery. 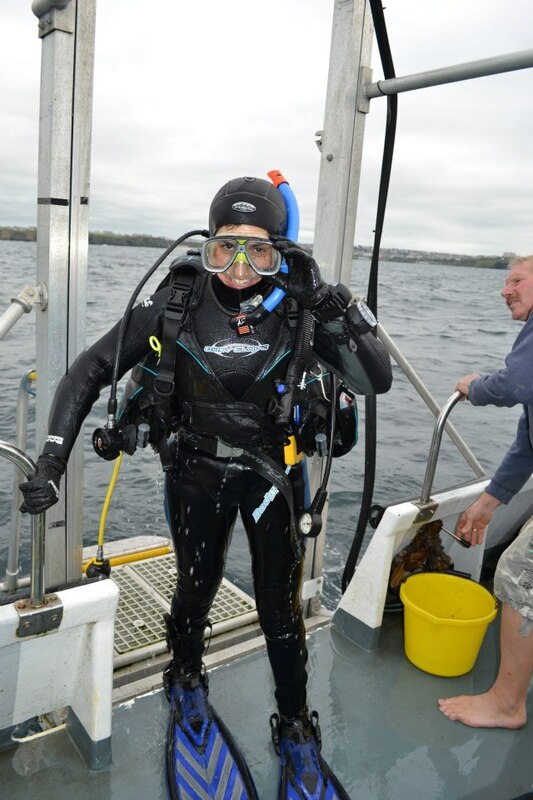 The world of marine conservation is a small world and indeed I used to work with Dom at the National Marine Aquarium in Plymouth when I was an undergraduate guide with lots of enthusiasm but little experience or knowledge! 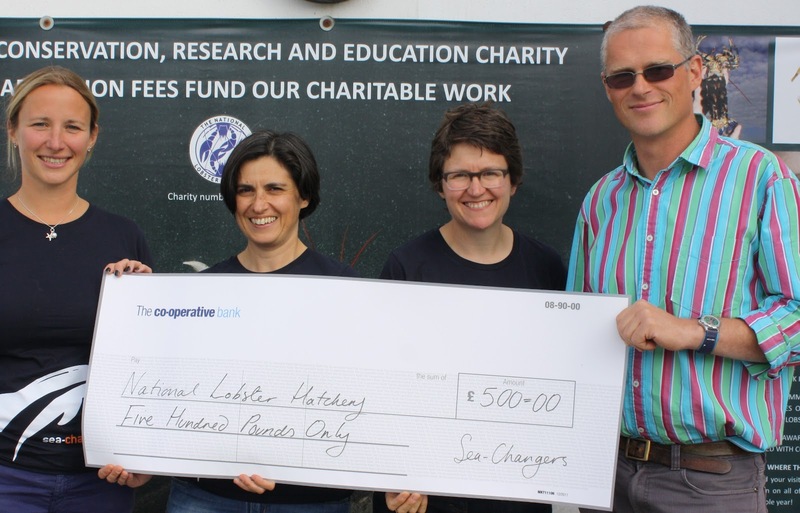 Dom very kindly took some time out to go through a talk to help clarify the background, work and vision for the National Lobster Hatchery charity. This was a real insight and on several occasions comments that Helen, Rachel or Dom made sent shivers down my spine – this is a good sign! The practical vision and direction of a charity is really dictated by the enthusiasm and responsibility of the individuals who run the charities. 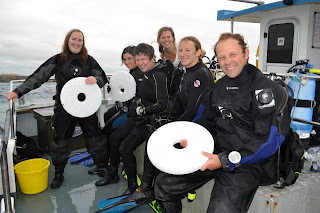 Here were some seriously impressive individuals with really fantastic, practical, logical and effective ideas to really make a difference in marine conservation. We were shown round both the visitors centre and also behind the scenes tour of the various laboratory equipment and tanks holding various stages of baby lobster and artemia shrimp to feed the lobsters. This really gave an insight into how much time and energy goes in to rearing these individual lobsters to be as healthy and robust as possible within this carefully controlled environment. This insightful morning made the opportunity of heading off to Newquay to meet with the “Atlantic Diver” boat to release some of the carefully reared lobsters such a real privilege! 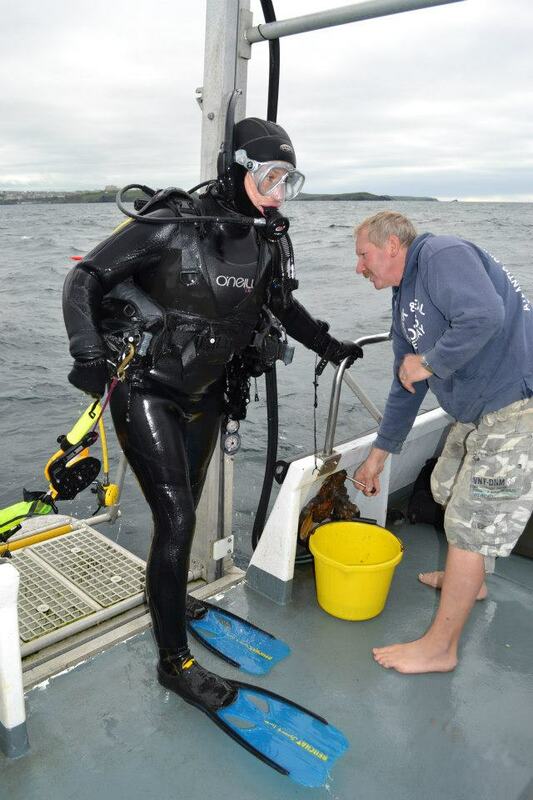 We jumped on board, met with some of the local Cornwall Wildlife Trust and set to sea with the lobsters carefully packaged up ready for release. Lobsters are grown on individual trays to prevent cannibalism! Dive plan made and buddy check done we descended on the shot line to be greeted with decent visibility and lots of unsuspecting Pollock and Wrasse. We had been instructed to look for “terminal moraine” type sediment but not to expect to find terminal moraine in this non glacial influenced area! Basically, we were looking for soft sediment with lots of rocky shards and cobbles. 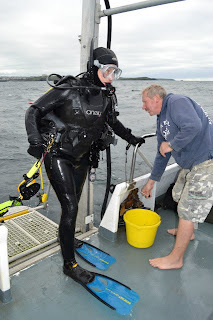 After a few minutes of diving around we found a nice patch of “cobbly bottom” and each pair of divers took their tray and carefully released the lobsters into the area. With a flick of their tails the lobsters found their way on to the sediment and quickly sought refuge under loose shale and rock. At which stage I think I squeaked through my regulator. It was a very gratifying process to be a small part of the process of helping create sustainable seas. 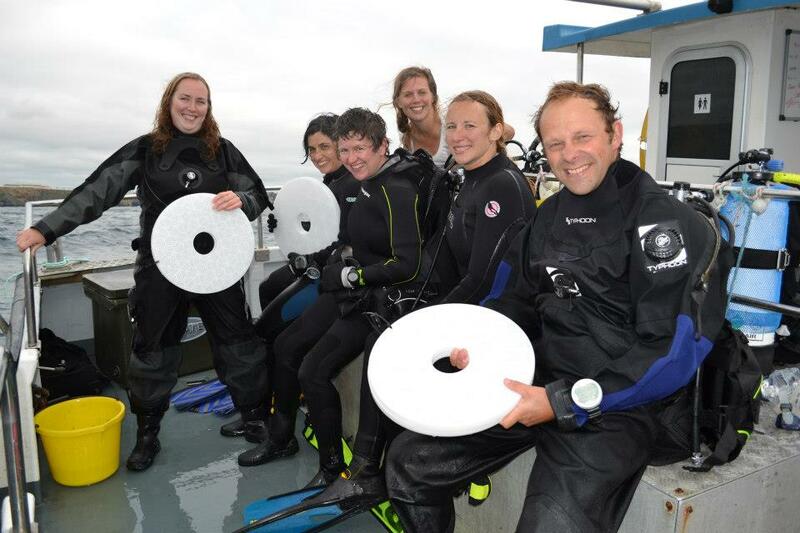 Post-dive buzz after releasing lobsters from the "doughnut" trays.